Want to market your business? Not sure what actions to take for optimal growth and results? Everyone is talking about the results social media can generate. And it’s partly bad and partly good. The thing is that the results brand are seeing from their efforts are results of hard work, great planning, and resources invested. Am I saying you can’t achieve those results? You can reach those results above and beyond, but the issue is that many brands that I come across believe that they can reach those results by sharing a few posts, leave a few comments, and then wait. But as you probably know, that is not the case. Social media has become more and more saturated, and to stand out, you need to take new approaches to the platform, and you need to put more effort to generate results. In this article, I’ll provide you with 5 ways to promote your business on social media for explosive growth. This means a detailed explanation of how you can achieve the incredible results social media is capable of generating for your brand. No sugar-coating! Micro-influencers has gotten all the attention in the last few years, and with all right! You’ve probably heard about influencers, and micro-influencers are just what they sound like. They are influencers with a lower, yet much more targeted and engaged following. 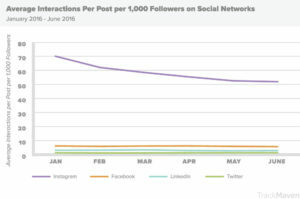 As follower count increase, the engagement tends to drop. That’s the general rule of social media. It can depend on your followers becoming inactive, others creating new accounts, and some people just getting tired of your content. However, at the same time the follower count increases, so does the price of working with the influencer, because most of them base their prices on their followers and how many they can reach in theory. The definition of a micro-influencer varies, and I’ve literally seen every single definition of them. Some people say that a micro-influencer has less than 10K followers, some people say 25K, others say 50, and some even strike with 100K. Exactly where the line is drawn doesn’t matter, but just know that micro-influencers have a smaller, yet more engaged audience compared to celebrity influencers and big influencers. 82% of consumers are “highly likely” to follow a recommendation made by a micro–influencer. Micro Influencers has 22% more ‘buying conversations’ than an average consumer. Micro-influencers are also great because they often have highly targeted that actually care about their niche. As a brand, this is perfect, because it allows you to reach the people who truly matter for your brand, and don’t pay for a bunch of nonsense followers. Finding micro-influencers used to be tough, but with tools like Veloce influencer directory, it’s easier than ever. Simply fill in the criteria you wish the influencer to have and click search! Now, you’ll be presented with a list of the most relevant individuals for your brand, so just select the individual you think matches your brand best. Remember to partner with influencers who shares your brand message and aligns with your values. This will allow you to create a better and more convincing influencer campaign. Most brands are afraid to use humor, but those who dare to see amazing results. It’s quite an interesting acknowledgement. The truth is that as long as the humor isn’t inappropriate, everybody loves to laugh. What is it that says that you shouldn’t use it in your marketing? By incorporating humor, you’ll bridge the gap between you and your audience which will make both you and your audience more approachable. There are many good reasons to why you need to use humor in your marketing, and there are only really a few brands who can say “it’s not suitable for us” because the truth is that the vast majority of brands will see great results from making their audience laugh. First off, humor helps build trust. Just think about it: do you enjoy being around funny people? Of course, you do! They have a tendency to make it very easy to trust them. Secondly, it allows your brand to stand out because most brands don’t dare to use it! Social media is starting to get saturated, but this doesn’t mean it is hopeless for marketing. Instead, it means that you need new approaches to getting seen. And those new approaches means using strategies that few brands use. Luckily for you, humor is one of them. And lastly, you become more approachable. If you are in a new group of people, which person will you go to first? The person who is joking and fun of course. These people present themselves as kind and sympathetic, and at the same time, they can give you a really good time. User-generated content holds a lot more marketing power than your standard professionally created content. In fact, 93% of consumers find UGC to be helpful when making a purchasing decision.What’s more, 71% of consumers also feel more comfortable buying a product after seeing other customers’ experience with your brand and products. Creating content for social media is hard. Especially when considering the fact that least amount of posts you should share is one post a day – on each social media platform. But luckily, UGC provides you with free content you can use, and the best part is that this is content that tends to be more effective in marketing than other types of content. Some people will share UGC content around your products on own initiative, but others need a push to create it. As a small brand, you can’t expect a ton of people to share UGC around your products. Especially if you don’t have a ton of customers. The first step to getting more content to choose from is to simply ask your audience to share it! In fact, you can even leave a little note in their order where you ask them to share a photo of them using that product on social media. To encourage UGC, to sort the content, and to create a sense of community, using a hashtag is the best way. 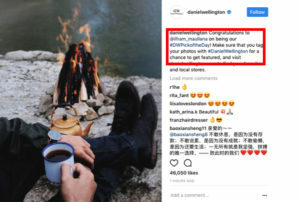 With a personalized hashtag, you’ll be able to gather all the content that comes from your audience in one place, and this also gives your customers an opportunity to interact with other people, this leading to a community around your brand. To further encourage UGC, you can reward those who share a post. The opportunities are endless. You can give a discount code to everyone who posts, send a free product, give them a 2 for 1 deal, and anything in between. Not only will UGC give you content to use, but it will also gain you a ton of valuable exposure because the people sharing it are sharing it for their friends to see. When most people think about building their brand on social media, most of the time, customer service isn’t part of the equation. It’s understandable, but it means missing out on an amazing opportunity. The thing is that your customer service and the experience you give your customers will have a huge impact on their thoughts about you, and also if they become returning customers. 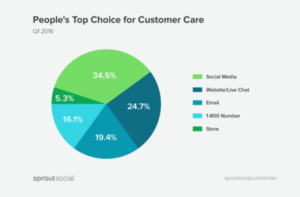 More and more people are turning to social media for customer service, and if you aren’t there to meet them, you are missing out on important opportunities to make your customer’s problems right, to engage with them, and to increase your customer retention. Customer retention is one of the single most important metrics you want to keep track of and work to improve, but the problem is that very few people do. But why is customer retention so important? Customer service on social media is an art that needs to be mastered, and if I’d go through it all from start to finish, we’d be here all day. There’s a lot to think about when working with it, but it is most important that you know the basics and the most vital parts. First off, you need to think about response time. This is a major part of providing a great experience to your customers. 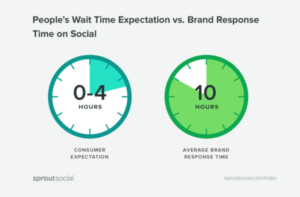 In fact, brands respond on average after 10 hours! That’s more than double the customer expectation. The bottom line is that you need to invest in resources that allow you to respond to your customers in a time that leaves them impressed because response time is one of the easiest ways to measure the quality of a brand’s service. Secondly, the world of customer service is changing, and more and more people are turning to social media for customer service questions. And it makes sense because social media is the place where people spend their time, so obviously, they will think that it’s smooth and easy to reach out to brands on platforms they’re already using. But the issue comes when you don’t respond to your customer’s questions and inquiries. In fact, close to 30% of people will go to a competitor if a brand doesn’t respond! Make sure you respond to every single message, even if it’s a complaint. Or more correctly, make sure you respond to an inquiry especially if it’s a complaint! Many brands shy away from complaints in the hopes that it will be better, but the truth is that responding to them in a good manner will help you convert then from angry to loyal customers again. If you, on the other hand, don’t reply, chances are they will tell their friends about their bad experience with your brand. To generate results with social media, it’s not enough to share a few posts and wait for the results to roll in. You need to have a strong strategy and plan to what actions you will take. All you need to do is have a strong strategy and plan to get going, then execute on a daily basis. Social media results don’t come after a day. Nor do they come after a week. They come after consistent hard work.